Perdure is my take on how to play Magic the Gathering (or Hearthstone) with a normal deck of cards, nothing else needed. Here’s a description of it’s rules. Shuffle a regular deck of cards (no jokers) and split it in the middle, giving each player 26 cards. Each player draws a hand of five. Randomise who goes first. Any cards that are turned sideways are turned back to normal, they can now be used again. The starting player skips this phase on his or her first turn, in all other cases this action is mandatory. If you can’t draw a card because your deck is depleted, you lose the game (see winning below). 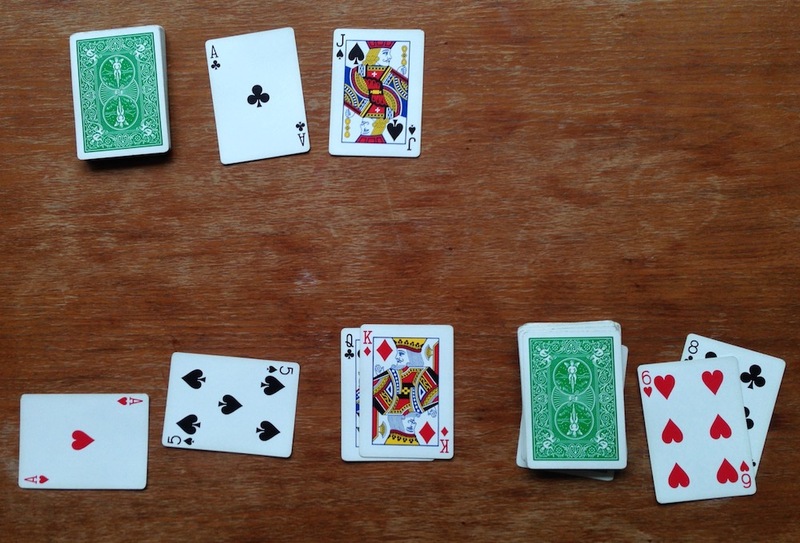 Land – Play any card face down to create a land. This is a free action, but you can only play one land per turn. A land can be tapped (turned sideways) to earn you 1 mana which can be used to pay for other cards. Creature – Creatures cost 1 to 5 mana to play and enter the game with summoning sickness, meaning they can’t attack the same turn that they were played (except for creatures of the Diamond suite). Each creature has two values, one for power (how much damage it deals), and one for toughness (how much damage it can take before being killed). This is commonly abbreviated 1/1, 2/2, and so on. See the next page for more info. Spell – There are four kinds of spells in the game, one for each suit. A spell costs 1 – 5 mana (depending on its value) and will perform an effect when it is played, then the card is put into your own discard pile. Cantrip – Any card can be discarded for the cost of 1 mana to let you draw 2 new cards from your deck. Enchantment – Play any card on one of your creatures to give it the power of that suit. A creature can only have one enchantment of each suit on it, and no enchantment in it’s original suit. When a creatures dies, all it’s enchantments are discarded with it. Select which, if any, of your creatures that should attack. Tap those creatures to mark that they won’t be able to block during your opponent’s next turn. Your opponent now gets to select which of his or her creatures that should block your attackers. A creature can only block one attacker but multiple blockers can gang up on a single attacking creature. When blockers have been designated, all creatures that are attacking or blocking deal their damage. In the case of multiple creatures fighting together, the owner of the single creature gets to decide how to divide the damage between the blockers. Creatures that are dealt damage equal or greater than their toughness dies and are put in their owner’s discard pile. If a creature is dealt damage that doesn’t kill it, keep track of this damage until the end of the turn. Any creature that was not blocked at all will deal its damage to the defending player instead. When receiving damage a player discards that many cards from the top of his or her deck. This phase is just like phase 3, i.e. you can play more cards. When satisfied, pass the turn to the other player. Any damage on creatures is removed, in other words they all have their health restored to their maximum. Whenever a player can’t draw or discard a card from the top of his or her deck (because it is empty), that player loses the match and the other one wins. If this happens at exactly the same time (because of two kings being killed) the player who’s turn it is, is the winner. Please note that you’re not dead just because your deck is empty, it’s the act of not being able to draw a card that makes you lose. If this was the first game of a match you play one more game, but with the other player’s deck. Switch decks, shuffle them and play again (the other player goes first this time). If the other player wins, i.e. the score is 1 – 1, the match is a draw and you should play another match until someone wins 2 – 0. The cards Ace, 2, 3, 4 and 5 are simple creatures with power and toughness equal to their value. They also cost as much mana as their value, i.e. the Ace costs one mana and is a 1/1, while a 5 costs five mana and is a 5/5. Attacking with a jack doesn’t tap it. A queen deals its damage first in a fight, if this kills the other creature the queen won’t get hurt. When killed, a king will deal damage equal to it’s power to the other player. Depending on what suit a creature has (and what additional suits it has gained through enchantments) it will have different powers. Gives the creature one additional point of toughness (+0/+1). Gives the creature one additional point of power (+1/+0). This creature can only be blocked by other creatures with flying. This creature can attack on the turn it was played (if played in phase 3; before the attack phase). These powers stack – a creature could have all four of them, if enchanted with the three other suits. You can’t enchant a creature with multiple hearts or spades to give it more +1 bonuses though. The cards 6, 7, 8, 9 and 10 are all spells. A spell has cost and level equal to the face value of the card minus five, i.e. a 6 costs one mana and has level one, while a 10 card costs five mana and has level five. Select as many cards from your discard pile as the level of the spell and shuffle those cards into your deck. Then discard the spell (it can’t be part of the cards selected). Deal as much damage as the level of the spell to a single creature or player. Gain mana equal to two times the level of the spell, this mana can only be used during this turn. For example, if you play the 8 of Diamonds (costing three mana) you will get six mana to spend on one or more other cards this turn. Tap and/or untap up to as many creatures as the level of the spell. For example if you play the 7 of Clubs (costing two mana) you could untap one of your creatures and tap one of the opponent’s.